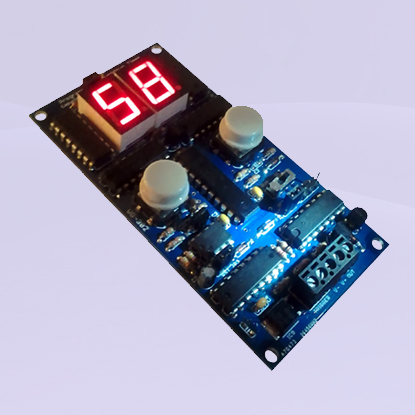 Add control and accuracy to your timing projects with this fully programmable countdown timer. Select between minutes and seconds with delays up to 99 minutes. Comes with dual buttons for easy programming, a blinking seconds indicator, fully debounced trigger input and a 500mA output for inductive and non-inductive loads. The unassembled kit includes instructions (including schematic and parts placement) and all the components to build one complete Programmable Countdown Timer. A soldering iron, solder and a pair of cutters are required for assembly. Programmable time delay up to 99 minutes with dual buttons and 7-segment displays. User selectable jumpers for 0-99 minutes, 0-9.9 minutes*, or 0-99 seconds. Fully debounced input can be triggered with pushbutton or other contact closure. Reset jumper for quick countdown zeroing and output triggering. Wide input supply voltage from 6 to 20VDC** and 250mA operational current. Current sinking output allows switching of inductive and non-inductive loads at the input voltage. * Jumper included to illuminate left-hand digit decimal place. ** Onboard regulation with thermal overload protection limits operating temperature to 150°F (65°C) at maximum input voltage.